And a future diabetes patient. Ugh.That`s nastier than peanuts in Pepsi (I`ve seen it done). glass bottle of coke, and a couple of fists of peanuts plopped into the bottle is pretty awesome. you should try it, not only see it done. that is, if you want to eat/drink something fairly unhealthy. I’m not sure about the pH of 7-up, but I’m pretty sure this would curdle the milk. Have fun drinking fizzy cottage cheese, kid. Sounds like an eggcream- my momma always mad it with cream soda, vanilla and whole milk! Probly just tastes like a thin, melted ice cream soda. But mom, I’m lactose intolerant! But mom, I’m diabetic AND lactose intolerant! Didn’t one of the chicks in Laverne and Shirley drink milk mixed w/ Pepsi? It was a different time, with different taste buds. 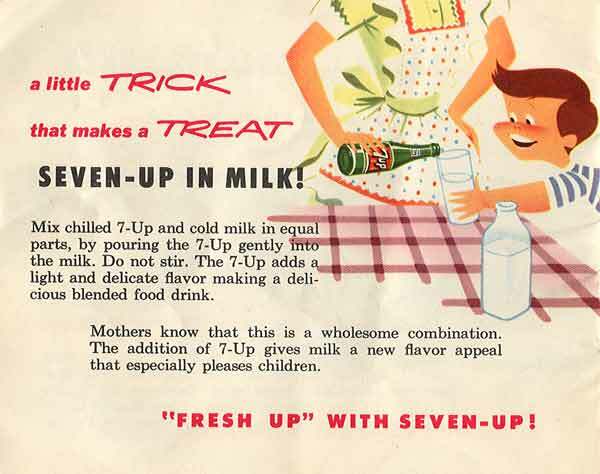 Besides, 7-up had lithium citrate in it up till 1950. So, mom was slipping little Johnny there a mickey.